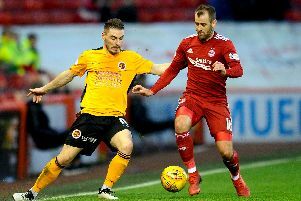 Those were the words Stenhousemuir boss Colin McMenamin said to his players at half time as they trailed Premiership Aberdeen 1-0 at Pittodrie in their Scottish Cup Fourth Round fixture. The Warriros were pinned back by the Dons for most of the first half but a combination of resolute defending by the visitors and sloppy final passes by the home side limited Aberdeen to very few clear cut chances in the opening 45 minutes. Max Lowe gave them the lead after 20 minutes from an easy tap in after a Graeme Shinnie cut back. Stenny went into the break just one behind but had not threatened the Aberdeen goal at all. 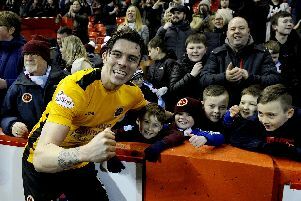 They had begun to find a foothold in the match just as referee Barry Cook blew for half time and the second period followed the same pattern as the first with Aberdeen controlling the game. However, the Dons could not find a way past Graeme Smith, who made some excellent saves to deny them though out the half, and Stenny made them pay on 70 minutes. Conor Duthie picked up the ball inside the Aberdeen penalty area but it looked as if poor decision making would see any chance go begging as his back heel was easily intercepted by Lewis Ferguson. However, the teenagers past to substitute Connor McLennan was then picked off by Ruairidh Davidson who delivered a brilliant cross from the left channel which completely split the Aberdeen centre halves. Mark McGuigan got the run on Scotland international Scott McKenna and with a picturesque diving header he left Joe Lewis no chance and levelled the scores. And that was it, Stenny’s one real opportunity in the match and they took it - just as their manager had told them they would have to. In the build up to the game a lot of talk had been about 1995, when Stenhousemuir shocked Aberdeen with a 2-0 win at Ochlview in the Scottish Cup. That Dons team, like the one on Saturday, was chocked full of internationalists like Dutch goalie Theo Snelders and Scotland stars Billy Dods, Duncan Shearer and Eoin Jess. The Warriors may have been unbeaten in their history against Aberdeen but even still very few were expecting them to pull off another famous upset. But pull one off they did and they ensured they were in the hat for the fifth round draw which took place on Sunday. The winner of Tuesday’s replay at Ochlview will host either Dundee or Queen of the South. Before Saturday’s match it was assumed by most in the game that it would be the Dons in that game but now it is clear for all to see, including Aberdeen, that that can not be taken for granted.